Gaius Aurelius Valerius Diocletianus Augustus, born Diocles, was Roman emperor from 284 to 305. Born to a family of low status in the Roman province of Dalmatia, Diocletian rose through the ranks of the military to become cavalry commander to the Emperor Carus. 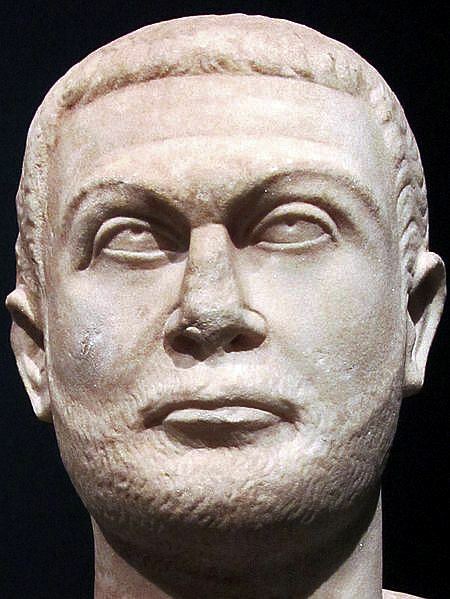 After the deaths of Carus and his son Numerian on campaign in Persia, Diocletian was proclaimed emperor. The title was also claimed by Carus' other surviving son, Carinus, but Diocletian defeated him in the Battle of the Margus. Diocletian's reign stabilized the empire and marks the end of the Crisis of the Third Century. He appointed fellow officer Maximian as Augustus, co-emperor, in 286. He reigned twenty-one years and then abdicated voluntarily. He lived out his retirement in his palace on the Dalmatian coast, tending to his vegetable gardens. Reverse: IOVI CONSERVAT, Jupiter standing left, holding thunderbolt and sceptre. Ref: CT 3.01.003; RIC 10/24 cor.